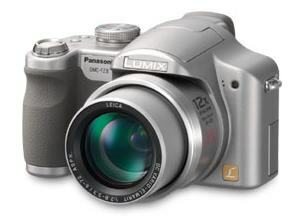 Panasonic announced the new 7.2 megapixel Panasonic Lumix DMC-FZ8 digital camera which features 12x optical zoom. While the DMC-FZ8 boasts the same high 12x zooming power as the DMC-FZ50, which is currently popular among demanding amateur photographers, it also enhances mobility with its compactness and easy joystick operation. Panasonic redesigned the FZ8 throughout to make it more stylish. A built-in memory with a capacity of approximately 27 MB is provided, and the camera accepts large-capacity SDHC memory cards. A metal mode dial also adds further strength to the design. A long battery life lets the FZ8 take around 380 on a single charge (CIPA). And the FZ8 can save image data in the RAW file format, which can be edited and developed with included software. For users who feel that ordinary compact cameras simply do not give them the functions and control they need for full enjoyment, the Lumix DMC-FZ8 serves as a gateway to truly creative photography.